Several years ago Present Group was engaged in commissioning a project for a modest oil and gas operator. Their CEO and Founder was typically charismatic and full of energy although we soon discovered that his personality was not as modest as his fledgling company. Early on when I started our journey at Present Group it was supposed role models like this who led me to question our current paradigm. For if these were the self-made achievers, so acclaimed by our business media, then where was I to find the inspiration and soul satisfying wisdom that I sought for myself and others. 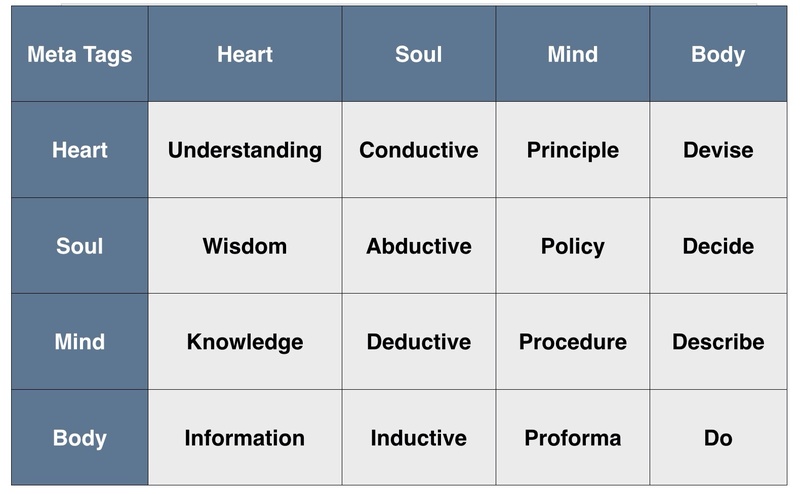 His observation has also stayed with me as I have contemplated how to collapse such a limiting duality by achieving scale with key value propositions so that Present Group might make both a positive and a meaningful difference in and to the world. Both of the above examples are cause for reflection. Even more so when you consider that the first CEO was dead within a year of the project, struck down by a massive heart attack. While the other has lived on into late retirement only to see his company and it’s once great culture unravel under his successors before being sold out and off to the short and the few. I should explain, the ‘short and the few’ is my shorthand for the majority of large public enterprises that inhabit our current economic paradigm. Basically the strategies that drive our economy are dominated by an obsession with short term gains; quarterly in most cases. I believe this is then further compounded because the economy is also mainly geared to serve relatively few within our society. For evidence, you need only look at the current remuneration scales for listed company CEO’s. To make matters worse, these packages are not only increasing in relation to the many but they are also increasingly becoming decoupled from both performance and reality. The ‘Short Fews’ may also serve as metaphor for a short fuse on a recurring time bomb economy with its regular bouts of boom and bust cycling. Especially when we consider how the power and influence of the short and the few can at times totally command the financial future and fortunes of the many. Usually by the short few; getting in, getting theirs and getting out, seemingly without caring who gets hurt in the process. From my experience the pursuit of short few strategies defines the majority of capitalists and venture capitalists and so there is less appetite and resources available to serve the long term and reward the many. This is a double blow to progress as it so often discourages great endeavours and public goods which can only ensue with patience and the maturity of delayed gratification. Many great industrialists of the past have found their own way to Frankl’s present space and paused to consider the inevitable diminishing returns of personal meaning by continuing this type of pursuit. In the past, Carnegie and Rockefeller were prime examples of recovering capitalists who are now more often remembered for the grand philanthropic gestures they bestowed in their second half of life. More recently Bill Gates has become resurrected from anti-trust silicon sinner to public trust social saint, but perhaps the greatest example of pausing to reflect and choose a path of redemption is the life story of Alfred Noble. Today the Nobel Prize lives on over a century after Alfred’s physical death and are presented for outstanding achievement in literature, peace, economics, medicine and the sciences. What is less known is the fact that during his lifetime he also amassed a fortune by inventing explosive products such as dynamite and gelignite. Alfred’s epiphany which later led him to dedicate his fortune to recognising and rewarding those who most benefited humanity came about by pure chance when his brother passed away. For a clumsy journalist mistakenly ran a long obituary for Alfred himself. The awful effect of reading his own obituary was devastating as the newspaper had gone on to describe him as the man who had made it possible to kill more people more effectively than anyone else who had ever lived. Shortly after this revelation Alfred was compelled to establish the humanitarian awards that still bear his name and in so doing totally transformed his legacy, if not his destiny. Alfred is by no means a unique case for there are many more examples of great individuals who required a defining trauma at the peak of their material powers before they could surrender their ego. My opening description of the late oil and gas company CEO was reminiscent of Zorba’s instinct to solely serve his own mission. My own life experience has taught me that this inevitably leads to angst and suffering while choosing instead to serve something bigger than oneself first manifests by not wanting more of the same, like Zorba but in needing less, like the wise old man. Usually this reflex between the first and second half of life, occurs not surprisingly at midlife, when we reach a point of diminishing returns. After a life spent fixated on satisfying personal pleasures and acquiring personal possessions (Involution) we tend to discover a hollow hall of mirrors and we each find that there is no other option other than to confront oneself and apply some inner work. There are many ways to describe the essential death process of one’s old paradigm and rebirth into a whole new way of thinking. The symbolic themes of crucifixion and resurrection, the long dark night of the soul or the Hero’s descent to destroy his covert nemesis be it Minotaur or Medusa are but a few. As are engulfment within the belly of the whale or hopeless in escape from the lion’s den. The biggest clue that you may be reaching this point in your own journey of consciousness is the advent of seemingly insurmountable challenges. One thing is for sure, your old paradigm will begin to die. Hence the diminishing returns of your previous objectives with their worn out methods that worked to get you there just don’t work anymore now that you are here. In ‘Falling Upwards’ Rohr beautifully captures the dramatic shift in consciousness that is required of us all. Very simply we have lived our lives with the premise of either–or thinking. It must be this way or that way, people are either good or they are bad. Up until now, it may never have occurred to us to collapse these dualities and so we have come to accept them as the one and only reality. Then, following each of our unique journeys of transformation an all new duality is called forth that allows understanding on the basis of and–both. Once this manifests we will immediately recognise our new self when old paradoxes no longer confound and instead they become consistent with a continuum that has always existed; only waiting for us to discover beyond our previous horizon. Beyond our tired old horizon the old dualities converge and collapse. The struggle to choose between the short and few versus the long and many also collapses in the new paradigm of and–both. For the higher calling of and–both to work its miracle we need only understand that to serve the long and the many also incorporates and serves the short and few; while the opposite condition is not true. At Present Group we have attempted to understand this life cycle process and not surprisingly mapped it with the Meta Model for Process. The final crisis–challenge stage is revealed as one of personal meaning which Nobel, Gates, Carnegie and Rockefeller eventually traversed. Until now this has required an individual ‘I’ or a collective ‘We’ to undergo a subjective transformation before the true nature of self can put the resources amassed by the short few in the first half of life to work on behalf of the many in the second half. This raises the important question; why wait? What if this enlightened consciousness to serve the long and the many were codified such that an enterprise’s concentrated wealth and resources could create public goods and begin serving society’s greater good from the very beginning. For several years now and in our own way, we at Present Group have been attempting to honour the long term and serve the many by laying the foundations for an intergenerational venture. We first had to consider ourselves as enterprise custodians for generations as yet unknown to us. Unlike a conventional ‘For Profit’ pursuit from cause to effect; a ‘For Purpose’ understanding instead acts to propel and progress us from effect to cause allowing evolution to ensue via eight holons of creation. In essence we are managing the present as a past state of our futures. This ethos is enshrined within a Meta Model inspired developmental holarchy of ‘8 Creations’ to serve Society as the eighth holon. This new enterprise paradigm as ‘Social Venture’ replaces the old money thinking of capitalists and venture capitalists with new momentum thinking as custodians for our own creations and as venture custodians for the creations of like-minded and like-hearted collaborators. 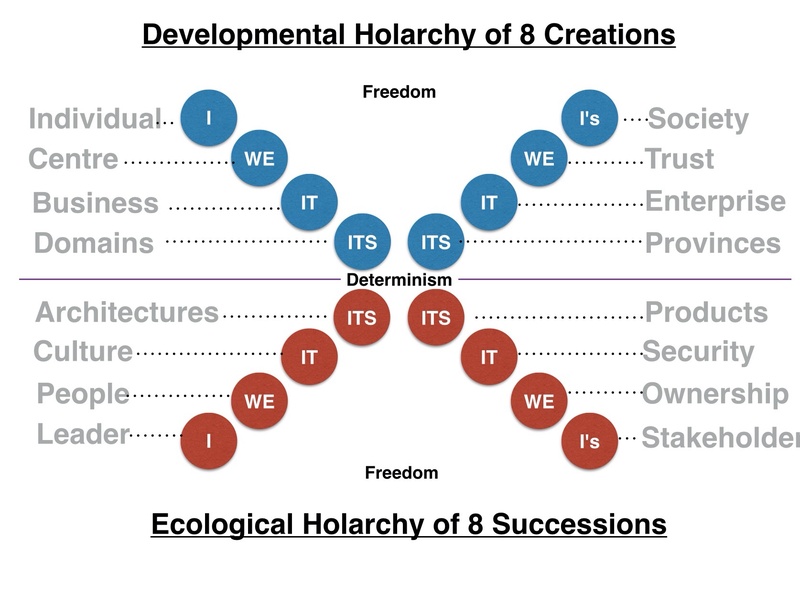 Present Group Developmental Holarchy of 8 Creations Showing the Reflex Between Stewardship (Left) and Governance (Right) Assigned with Integral Labels I/WE/IT/ITS. Simply for an exit strategy following one life cycle. As a job creation or individual security scheme. To position ourselves separate to Society. Create an environment that fosters individuation. Extend processes that change the whole nature of work. Maintain a quadruple bottom line: Purpose, Planet, People, and Profit. Serve society, changing the world for the better through Completions. Recently, Present Groups search for its own holy grail to become a self-renewing enterprise received a huge boost. I for one had become one eyed about pursuing our developmental holarchy of 8 Creations at all costs. This had only served to risk burn out within our leadership team and leave many strung out across incomplete structures of enterprise architecture. Bill’s journey and the culture that has arisen at Adapt are like a parallel universe to our own. Adapt by Design is founded on 8 universal successions which completely complement our 8 creations. Before Adapt, Present Group’s developmental holarchy was akin to RNA. Like DNA, RNA is assembled as a chain of nucleotides, but unlike DNA it is more often found in nature as a single-strand folded unto itself, rather than the paired double-strand of DNA. For the first time this union bestows a double helix to our cultural DNA allowing us to evolve to the next level. Present Groups ‘Revolve by Nature’ Developmental Holarchy of 8 Creations Integrated with ‘Adapt by Design’s’ Ecological Holarchy of 8 Successions. This is the same pattern found in nature and life itself. 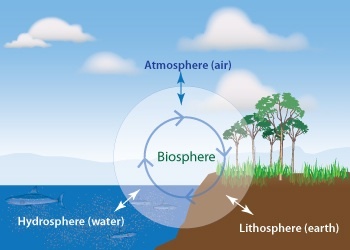 Our biological proliferation and continuation as a long and many species has required the twin properties of evolutions renewal and adaptations resilience. Whatever is born must die leading to renewal and whatever is alive must adapt leading to resilience. As individuals and as enterprises we often deny this dual fact, or favour only one or the other when both are absolutely essential. A distinct case of not either–or but of and–both. Within one life cycle I/WE can adapt but we cannot evolve. 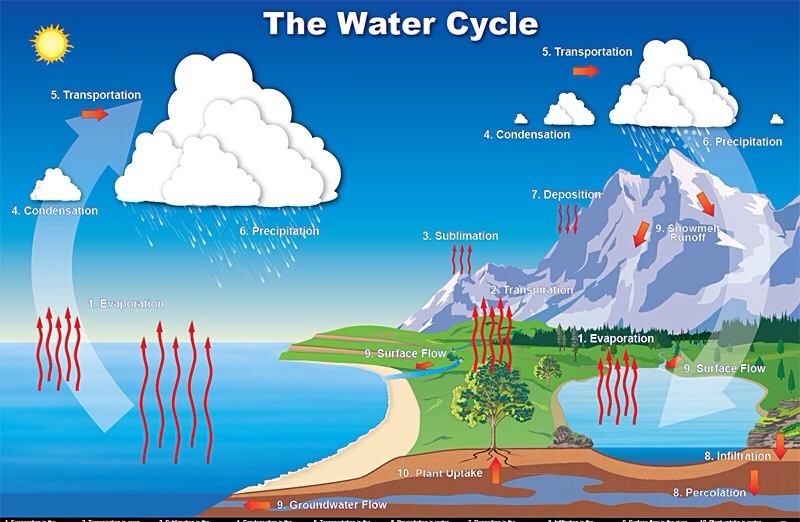 Across life cycles IT/ITs can evolve but they cannot adapt. As individuals we can choose to adapt; learn and relearn, as we navigate life but the die is cast in terms of evolution because our source code has been dealt at birth. This is also true for a business and its culture. Within Present Group the developmental holarchy had created a breadth of creation but with no new ecological succession we lacked resilience and as a result the many emergent life cycles we had created as businesses and centres may not survive a crisis. Equally by only embracing an ecological holarchy a depth of succession is guaranteed but with no developmental re-creation there is a danger of not renewing. If this is the case then the one life cycle of any one business is destined to pass through the innovation diffusion curve toward its natural death. 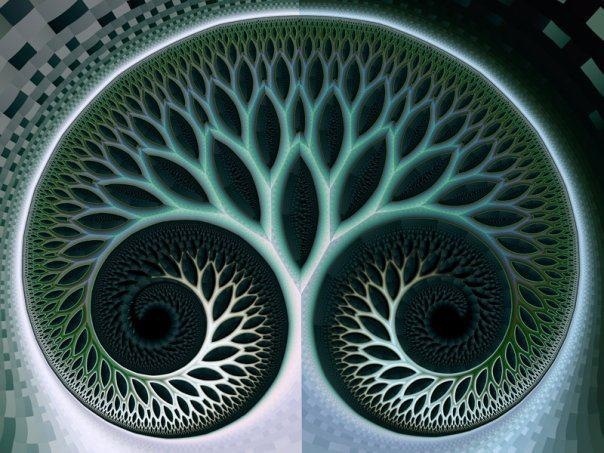 As a result of embracing the developmental holarchy, Present Group has become generative. Much like a 3D printer that prints other 3D printers we can reproduce businesses as Value streams and centres as Function streams. 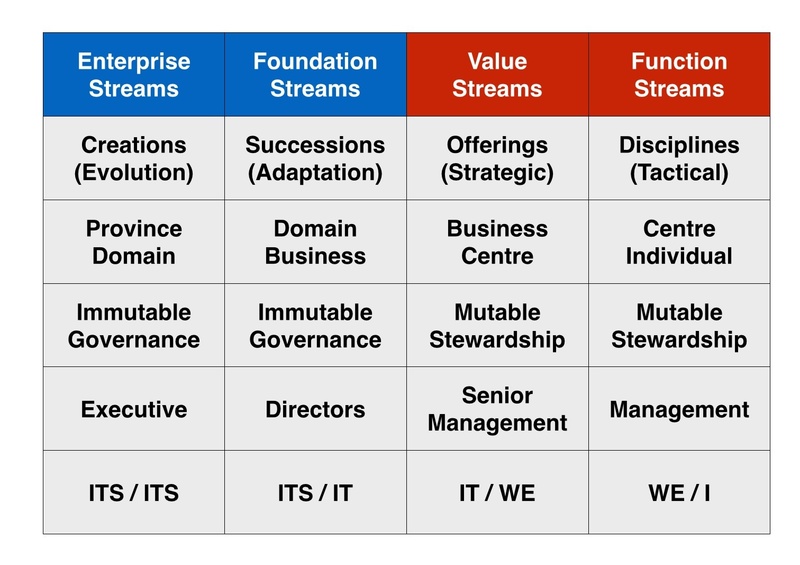 Only now we are also embracing the ecological holarchy of Adapt to reach full unification of purpose between our Enterprise streams of 8 Creations and Adapts Foundation streams of 8 Successions. Finally the above chart shows all four streams of progression as two base pairs within a suptainable Present Group enterprise with its combined immutable properties of evolution and adaptation. The mutable streams of value and function can then perpetually cycle and self renew without selling out the whole and becoming the Past Group in the process. “We can conclude that a project as grand as the scientific-mythical construction of victory over human limitation is not something that can be programmed by science. Ernest’s ‘Denial of Death’ is by no means a light read so I will try to synthesise as best I can in my own fashion; Once all of the existential angst has played out and you transcend the Hamlet phase of ‘to be, or not to be’ by becoming whole, then and only then can you surrender to your true life’s purpose which Ernest described as the ‘Causa Sui’. In Latin, Causa Sui means “cause of itself” and denotes something which is generated within itself. Therefore it relates to the purpose that individuals or objects can assign to themselves. If that purpose is bigger than oneself or itself then the concept can become an immortality project. A vessel beyond the one life cycle, where someone or something can create meaning or continue to create meaning beyond its own life cycle. However, once glimpsed, if you are to give up and abandon your own causa sui, your personal vision–mission and opportunity to change this world for a better world, then there awaits another kind of surrender…. it is to surrender the future to someone and–or something else…. This article was written by Brian Grimmer Chairman of Present Group incorporating insights, methodologies and understandings derived from extensive cooperation with Peter Midgley CXO of Present Group on the Meta Model for Process. The terms ‘Suptainable’, ‘Surtainable’ and ‘Subtainable’ are new terms developed by Peter Midgley to model a holarchy of durability.